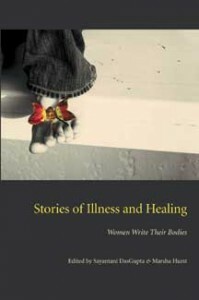 Stories of Illness and Healing is the first collection to place the voices of women experiencing illness alongside analytical writing from prominent scholars in the field of narrative medicine. The collection includes a variety of women’s illness narratives—poetry, essays, short fiction, short drama, analyses, and transcribed oral testimonies—as well as traditional analytic essays about themes and issues raised by the narratives. Stories of Illness and Healing bridges the artificial divide between women’s lives and scholarship in gender, health, and medicine. The authors of these narratives are diverse in age, ethnicity, family situation, sexual orientation, and economic status. They are doctors, patients, spouses, mothers, daughters, activists, writers, educators, and performers. The narratives serve to acknowledge that women’s illness experiences are more than their diseases, that they encompass their entire lives. The pages of this book echo with personal accounts of illness, diagnosis, and treatment. They reflect the social constructions of women’s bodies, their experiences of sexuality and reproduction, and their roles as professional and family caregivers. Finally, and perhaps most importantly, Stories of Illness and Healing draws the connection between women’s suffering and advocacy for women’s lives. EditorsSayantani DasGupta, MD, MPH, is a faculty member in the Division of General Pediatrics and the Program in Narrative Medicine at Columbia University. She teaches courses on illness narratives and narrative genetics at Sarah Lawrence College and is a prose faculty member in an intensive summer seminar on “Writing the Medical Experience.” She is the coauthor of The Demon Slayers and Other Stories: Bengali Folktales and author of a memoir of her time at Johns Hopkins Medical School, Her Own Medicine: A Woman’s Journey from Student to Doctor. Marsha Hurst, PhD, is director of the Health Advocacy master’s program at Sarah Lawrence College, where she teaches courses on the history of health care and women’s health. She writes and speaks on ethics and advocacy in health care, women’s health, and advocacy education. She works with patient advocacy organizations, with individual, professional, and lay advocates, with policy advocates, and with community-based advocacy programs. She is a cosponsor at Sarah Lawrence of “Writing the Medical Experience” and has been involved in research and program development around the importance of narrative in advocacy.